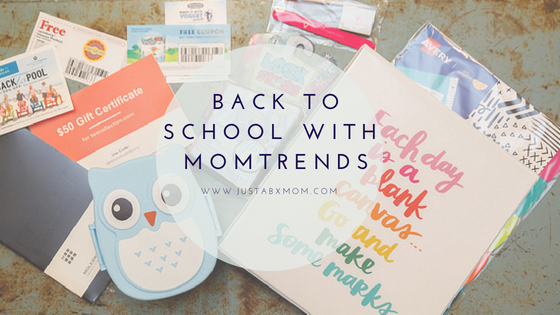 We were invited to attend the MomTrends Back To School event as press. As always all opinions are honest and my own. This showcase made some mom dreams come true too because it gathered some really cool brands in one place so we can get a handle on many of those back to school needs. Mabel’s Labels – I think you know by now that we love Mabel’s Labels. We use them for EVERYTHING. School stuff, books, clothes, birthday parties and more. The possibilities are endless and they have the cutest designs. JustaBXgirl loves helping me design her labels on the website. If you’re looking for a place to get your back to school labels from look no further. And right now you can save money by using discount code MOMTRENDS10 when you check out. Oh, but you know what’s even better than a discount? Getting something for free! Yup, our friends at Mabel’s Labels will be giving one of you a free School Combo of the winner’s choice ($42 value). Keep reading to find out how to win! Avery – If you’re looking for a reason to be happy with Back To School then Avery and their Amy Tangerine Collection is for you. The colors and quotes being used this season will make the grumpiest students smile. I’m hoping to add some of the folders to my collection to help me become more organized! These binders, dividers, and folders are just the thing to brighten a student or teacher’s day. After seeing some of my photos my cousin shared that she is going to get some of the heart style to use in her classroom as a way to remind her students that they are in a safe place filled with love! Epson – The amount of paper and in we go through in my house is crazy. I’m excited that Epson has found a way to not only deliver the quality printing products that we have all come to expect from them but also give us a new option that is better for our pockets and our world! The Expression ET-2750 EcoTank, can print up to two years without you needing to replace the ink! And when you do need to replace the ink you will be paying less for the bottles of ink than you did on those ink cartridges. You can order an EcoTank (ET-2750, ET-3700 and ET-4750) printer here and get FREE 2-day shipping using Code: ECOTANKMOMTRENDS2018. Good until 9/3/2018. Tea Collection – We know that Back To School time isn’t just about what’s inside your bag and head. For many of our littles it’s about what they’re wearing! Tea Collection has us covered for beautiful and quality apparel. You might remember when I shared some of their fall fashions on my IG at the beginning of the summer. They do a wonderful job of getting their inspiration from different countries and cultures. This season they’re focusing on America. This is the brand that JustaBXgirl represented during the show. We can’t wait to pick up a few more items from them. Stonyfield Organic – Once you have supplies and clothing picked out you need to start thinking about what will they be eating! Yup, a parent’s job is never done. If you have a selective eater at home like I do then finding new foods can be a bit stressful. I was excited when JustaBXgirl pulled me over to the Stonyfield table because she recognized the yogurt from school. Since she was familiar with the brand from enjoying it at school she was open to trying some of their newer items which she really enjoyed. Guess what we will now be stocking up with at home! Now that you’ve learned about my favorite BTS picks from the MomTrends event tell me which is your favorite. Add what item you’re hoping Mabel’s Labels will save you from having to replace in the comments for your chance to win the School Combo ($42 value). Winner will be selected on Monday, 8/13. The winner will have 48 hours to respond to notification email before being disqualified and new winner selected. Must be continental US resident to enter. My nephew used to lose those sweaters what felt like daily! I love the colors of the Amy Tangerine collection and yogurt is a staple in our house and our brand of choice is Stonyfield Organic. Thanks for the chance to win a pack of Mabel’s Labels, they are so durable and the designs are adorable. I’m hoping they help keep my pens and pencils from disappearing. I agree. The colors make me smile! My favorite pick is Stonyfield Organic Yogurt! Such a good choice for a snack! I hope Mabel’s Labels will save me from replacing lunch boxes and pens/pencils.